Scientists now think that two kinds of active galaxies known as blazars actually represent a hybrid kind of blazar that evolves from one type into the other. Image uploaded June 17, 2014. The two different classes of jet-spewing active galaxies called blazars may, in fact, be a single hybrid type that evolves over time, according to new research. The luminous cores of most if not all galaxies contain a supermassive black hole, which is millions or even billions of times more massive than the sun. In some "active galaxies," gas trapped by the black hole's gravity forms a hot accretion disk as it spirals down. Blazars appear to produce more gamma radiation than other types of active galaxies, but this may be because one of their jets is pointed toward Earth. (Blazars are generally defined as quasars that are viewed jet-on). 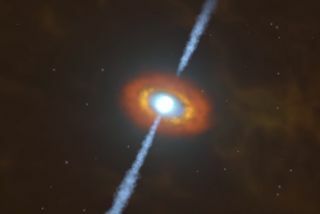 Astronomers currently recognize two types of blazars. Those known as flat-spectrum radio quasars (FSRQs) have smaller black hole masses and weaker jets but strong accretion disk emissions and much higher luminosities. On the other hand, the type known as BL Lacs are completely dominated by their jets, with accretion disk emissions either being weak or nonexistent. "We can think of one blazar class as a gas-guzzling car and the other as an energy-efficient electric vehicle," study lead researcher Marco Ajello, an astrophysicist at Clemson University in South Carolina, said in a statement. "Our results suggest that we're actually seeing hybrids, which tap into the energy of their black holes in different ways as they age." Ajello and his team came to this conclusion after studying how the distribution of blazars changed over time. They collected redshift data on BL Lacs using numerous instruments, including the Hobby-Eberly Telescope at McDonald Observatory in Texas, the Keck Telescope in Hawaii and NASA's Swift satellite. (To measure distances of faraway objects, astronomers rely on redshift, or how much the expansion of space has stretched an object's light to redder wavelengths). They obtained the distances of about 200 BL Lacs and compared the galaxies' distribution across time with a similar sample of FSRQs. They found that FSRQs began to decline in number around 5.6 billion years ago — the same time at which BL Lacs, particularly those with the most extreme energies, steadily increased in numbers. "What we think we're seeing here is a changeover from one style of extracting energy from the central black hole to another," said team member Roger Romani, an astrophysicist at the Kavli Institute for Particle Astrophysics and Cosmology in California. That is, the FSRQs became BL Lacs over time. The idea goes like this: Early in the universe's history, large galaxies grew out of collisions and mergers of smaller galaxies. The activity provided the supermassive black holes with bountiful gas, which resulted in large, bright accretion disks. Some of that gas powered the jets of the "gas-guzzling" FSRQs, while the rest fell into the black holes, increasing their spins. The galaxy collisions eventually slowed as the universe expanded, leaving less spiraling material for the black holes. The accretion disks became depleted, and the resulting black holes were fast-spinning and more massive than ever. The accretion energy the FSRQs once had was stored in the increasing rotation and mass of the supermassive black holes. That stored energy allowed the blazars to continue shooting out their particle jets and high-energy emissions as BL Lac objects, even without large accretion disks. This hybrid blazar idea implies that the luminosity of BL Lacs should decrease as their core black holes continue to lose energy and spin. The researchers hope to test this hypothesis with larger blazar samples.